With tangy cranberries, toasted almonds and nutty-flavored quinoa, this scrumptious side is a nutritious and delicious alternative to most traditional stuffing recipes. 1. Preheat oven to 300°F. Spread sliced almonds onto a jelly roll pan in a single layer. Toast for 7-8 minutes. 1. Meanwhile, add cooked quinoa, green onion and cranberries to a medium bowl and toss to mix. 1. In a separate bowl, whisk together maple syrup, olive oil, red wine vinegar, dried thyme and salt. Pour over quinoa mixture and stir to combine. 1. 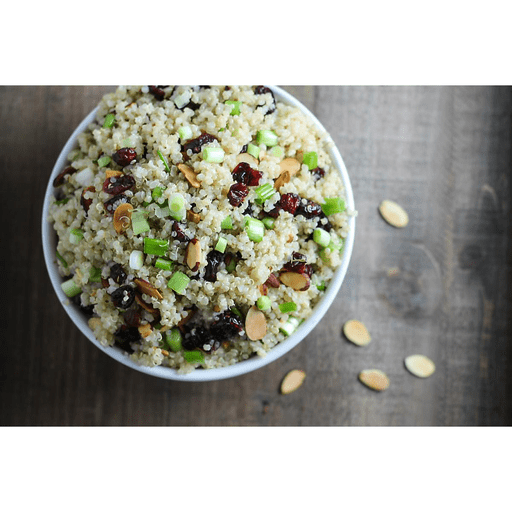 Top quinoa with toasted almonds and serve warm. Calories 170, Total Fat 7g (Saturated 0.5g, Trans 0g), Cholesterol 0mg, Sodium 200mg, Total Carbohydrate 25g (Dietary Fiber 4g, Sugars 12g), Protein 4g, Vitamin A 2%, Vitamin C 2%, Calcium 4%, Iron 6% *Nutritional values are an approximation. Actual nutritional values may vary due to preparation techniques, variations related to suppliers, regional and seasonal differences, or rounding.